Productivity is all about getting the most out of your workforce without paying more for it or upsetting your employees with increased demands. 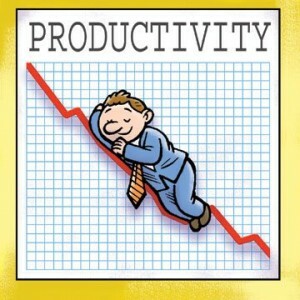 Unfortunately, it’s really hard to get more productivity out of your venture without doing one or the other. That’s why the following five free ways to help get the most of your minutes are so important for young businesspeople to remember. It’s not everyday you can make more of your business without spending a dime. This certainly isn’t technically free, but paint for the office is certainly tax deductible. It’s an inexpensive way to boost office morale. Simply put, nobody likes looking at white walls for 8 hours a day. Human eyes need stimulation. The cheapest way to take care of this is to paint the walls in your office a motivating color. Natural colors like green keep people feeling refreshed, while bright colors keep minds motivated. You’ve already invested in office space which shouldn’t go to waste, but evidence suggests that workers are typically more productive when they’re doing their jobs from home. Setting aside Fridays or an optional day of the week for employees to stay home to do their jobs is a great way to get some extra work out of them they otherwise might not feel up to producing. In the age of cloud computing, this is an option that’s increasingly becoming a core value of new businesses. Today, there’s virtually no way people can justify not staying connected. Between email, texting, social networks, and good old fashioned phone calls we can always reach out to each other whenever we need to. But when it comes to the relationship between employer and employee, a limited connection works best to keep workers from becoming overwhelmed. Too many requests from too many different angles can lead to analysis paralysis among the workforce. There are countless free apps available for iPhones and Android devices. Depending on the nature of your business, some of these apps can be incredibly useful in helping employees stay up-to-date, active, and aware. PDF readers can allow workers to read documents on the go, and Skype enables meetings to be coordinated among staff from conceivably anywhere on Earth. Don’t stock up on the latest business advice books on productivity or invest in an office cappuccino machine before trying out one or several of these free tactics first. You might be surprised by the numbers at the end of the week after you implement a few. Either way, there’s no risk, so why not? The most you have to lose is the mundane color of your office walls. This is a guest post by Jessica Wagner. If you would like to guest post, contact me!